Lindsay has been playing for audiences in Texas and around the country since 1974 and is known nationally as one of the world’s top autoharpists. During the 1980s he performed frequently at the Kerrville Folk Festival and has accompanied Peter Yarrow, David Amram and others on stage there. 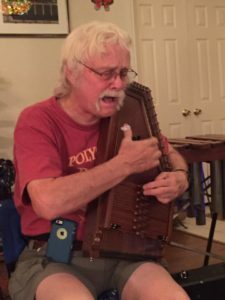 Among the many festivals and venues he has performed and taught at are the Walnut Valley Festival, the Mountain Laurel Autoharp Gathering, the Ozark Folk Center Autoharp Jamboree and the California Autoharp Gathering. 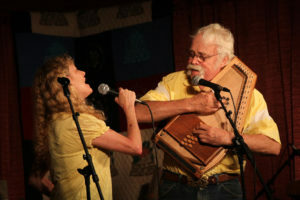 A dynamic and exciting player and performer, Lindsay is best known for his mastery of the chromatic autoharp. His repertoire and style have pushed the instrument into new musical territory embracing jazz, ragtime, and modern and traditional popular standards. His performances are full of infectious energy which makes it hard for his audiences to keep from foot-stomping and hand-clapping. Lindsay frequently performs with his wife, Cheryl Dehut, who provides lovely vocal harmonies to many of his songs. 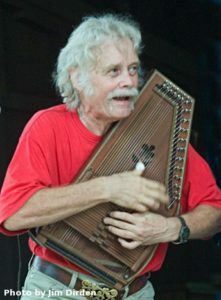 Lindsay was a winner of the Kerrville Folk Festival’s New Folk songwriting contest in 1979, and for his innovation on the chromatic autoharp, and for his support of the larger community of autoharp players and enthusiasts, he was inducted into the Autoharp Hall of Fame in 2004.